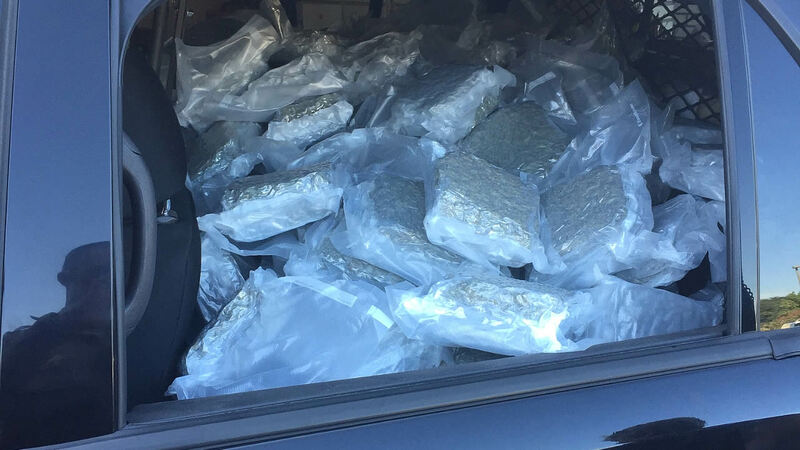 CLOVERDALE, Calif. -- California Highway Patrol officers arrested an Oakland man Tuesday afternoon after 225 pounds of processed marijuana were found in his vehicle during a traffic stop, a CHP spokesman said. A CHP officer pulled over a Subaru Legacy that was traveling at 75 mph on southbound U.S. Highway 101 near Citrus Fair Drive in Cloverdale around 3:45 p.m., CHP Officer Jon Sloat said. The officer smelled marijuana coming from the vehicle and asked the driver, Brett Lee Wilson, 31, if he had any marijuana, Sloat said. Wilson said there might be a joint in the vehicle, but when a CHP K-9 unit arrived, a search of the Subaru revealed multiple vacuum-sealed bags containing 225 pounds of marijuana, according to Sloat. Wilson invoked his right not to speak to officers and was booked into Sonoma County Jail on suspicion of possession and transportation of marijuana for sales, Sloat said. Wilson posted bail and was released from the jail Wednesday morning, a jail spokeswoman said.